Denim Alterations & Jean Repairs Online | Williamsburg Garment Co. In effort provide the best denim alterations services nationwide, we made it cheap and easy to order professional jeans alterations online. Here, you can purchase custom tailoring for any brand of jeans, including Williamsburg Garment Company jeans. 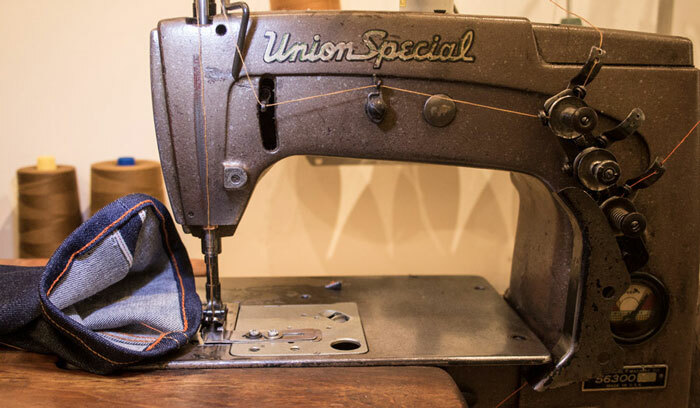 For those not located in New York City or close to our Brooklyn denim store, you can order jeans alterations, repairs, chain stitch hemming, tapering and other customizing from anywhere in the USA. If you can add a product into a shopping cart, you can quickly order alterations. No forms to fill-out and you don't have to come into the store for a fitting. Your time is valuable, so we email you a shipping label shortly after check-out. A $15 USPS shipping charge gets your jeans here and back to you. In general, we ask for 1 to 3 days. Depending on how busy we are and the type of alteration or repair, some jobs are received and shipped out the same day.